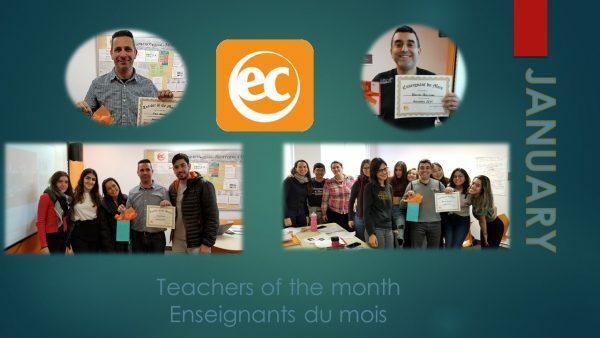 EC Montreal’s January Teachers of the Month! Every month EC Montreal students have an opportunity to vote for their favorite teachers. Our student ambassadors help to distribute ballots to all the students. The ballots ask two very simple questions; who is your favorite teacher? and Why? The why question is really important to us as this is where our students have a chance to comment on their teachers. This month our students have voted Peter Russel as our English teacher of the month and Yasser as our winning French teacher. We surprised Peter and Yasser in their classes today. They received a “teacher of the month” certificate and small gift. Their students cheered and posed proudly with the winning teachers. Because he can be very mean but in a funny way. His classes are always very interesting. Because he teaches in a fun and good way but in the same time he strict with us in class to help us. He’s the best. He’s so funny and he teach every topic very well. I’m not tired in there. Because his way of teaching is very nice and I could learn a lot of new things. He is very kind, always kind. She has great patience and she is so fun. She makes funny the class. Explains very well and his lessons is very interesting. She’s an excellent teacher and she explain well. I like her as she teaches us by heart. Elle est tres gentile et drole. Because she is the best teacher ever! Elle est bon professeur et sympatique. Un point, c’est tout. Because she’s very patient and puts lots of effort in teaching students and she is great! Thanks. Because she’s patient and gives a happy and good lesson, making sure everyone understands. Because she is explaining well all we ask. Because she worries that you actually learn and teaches very well. Because she has patience. She always smiles. She always repeats again and again the words or the subject we are learning. Because she explains really well. Because she was great teacher and she always take care of the students and she asks if we are understanding the subject. She is very kind and her classes are always interesting and productive. Clever, careful, she always makes sure that we understand all the topic. Her style of teaching is very excellent. She’s really nice, and her classes are being amazing. He is attentive, funny, and really good with explanation. Because he is helpful person. He is funny and talk with us about everything. Because he is really fund and kind. Do funny activities, talk with others. He is so funny and a great teacher! Because he is still interesting about my problems although I am not at his class. He pays attention with the students. Because he is a really good teacher. Pourquoi il montre bien plus que de la matière, la musique française, le cinema. Ces classes sont très dynamique. I like his classes because he gives us a lot of extra activities to do as homeworks and shows us a lot of videos. Parce qu’il est attentif, il explique bien, se scours sont dynamiques. Parce que il est attentive et se scours sont plus dynamiques. Il est plus compréhensif et plus ouvert avec les étudiants. He is very patient, dynamic and energetic. He is willing to teach correctly to everyone. Because he encouraged the study of French even outside the classroom. Il rend son cours unique, très intéressant et divertissant. She’s very charismatic and loving with her students. Because she is very entusiastic about teaching, making me entusiastic about learning. She is so excited, happy, nice and warm welcoming. She is really excited and it is clear that she loves what she does. She is happy and attentive. Not only a great teacher, but also, a great person to talk with. Because she always tries to explain everything as clear as she can. Her explanation is easily to understand. She has a perfect way to teach and catch the attention. She’s quite easygoing teacher, respectable and patient to explain the content. He told us many things in unique and humorous way. I like his teaching style! I’ve never get bored in his class! He teaches us in a funny way. The way teaching and interacting with the class makes teaching fun and facilitates learning. He always has a good attitude, so we can learn more with him. He’s always available and he’s the teacher I prefer the most. Parce que elle est très dynamique et compétente. Elle est très attentive e les classes sont amusant. Learn a new language at our English school in Montreal and meet our wonderful teachers!